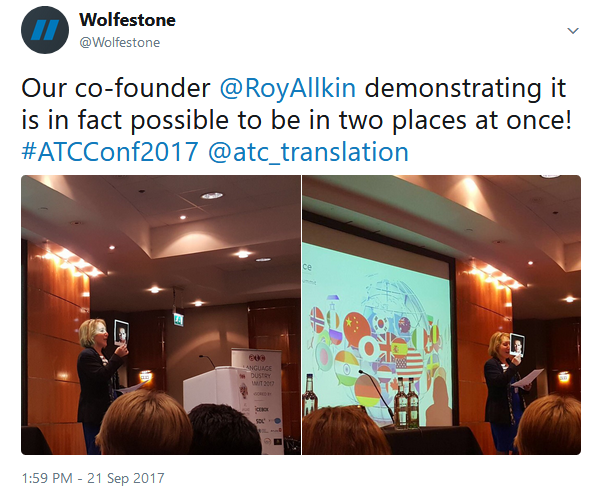 Every year in September, the Association of Translation Companies (ATC) hold their annual summit. This year, I was delighted to attend with Maria, leader of our LSP team, as Wolfestone’s delegates. We really enjoyed all of the talks and came back with a lot of food for thought as to how we could use the knowledge we gained to serve our internal operations, and ultimately, our clients. I won’t have space to go into detail about all the talks, so here are some of the ones I got the most value from as Operations Manager at Wolfestone. After Roy/Ruth’s highly entertaining opening address in which Ruth proved that Roy can actually be in two places at once, the conference kicked off with a few talks about sustainability, which reaffirmed the principles and values we already apply here at Wolfestone (project managers are awesome, strong relationships between people in the industry are important, and metrics are key in tracking progress). The next section focussed on technology. I love translation technology, my mouth waters at all the possibilities, so this section gave me lots of ideas to take home and put on my operational wishlist. It was kicked off by Tony O’Dowd, CEO of KantanMT. He described the capabilities and functionality of neural machine translation vs statistical machine translation by drawing comparisons with earlier and later versions of the Star Trek Enterprise (the giant later version is Neural MT). The most important thing I took from this is that while Neural MT is light years ahead of statistical based MT, it’s still not a serious threat to human translators. MT certainly has its place and we do offer it at Wolfestone, but the fact that computers don’t understand our human world means that there’s still a very long way to go. Alessandro Cattelan from Translated srl also made my heart leap with the possibilities of automated assistance with translator selection, using clever searching technology within their database. Following that was Maria’s former university tutor and now COO at LexiQA, Vassilis Korkas, describing the ideal QA tool, which sounded like a project manager’s dream come true. 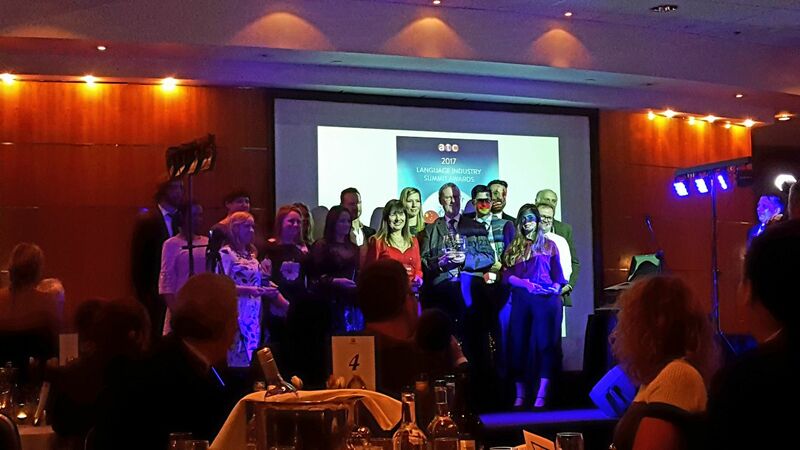 The highlight of the ATC Summit 2017 for us was certainly the awards ceremony, as our very own Elliot Nedas was shortlisted for the ATC Sales Person of the Year Award. Maria and I sat in the audience and wished him all the best of luck and were thrilled about the announcement that he won. Overall, it was a fun and enriching couple of days, and I am very much looking forward to the next time I go along. 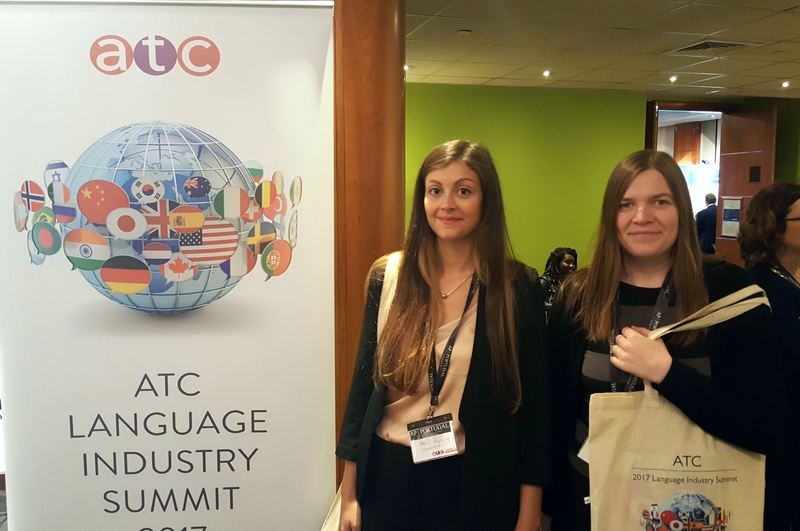 Thank you very much to the ATC for hosting the 2017 Language Industry Summit. Article written by Chloë Driscoll, Operations Manager, Wolfestone.